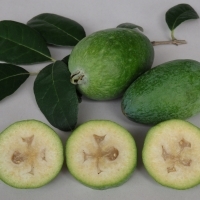 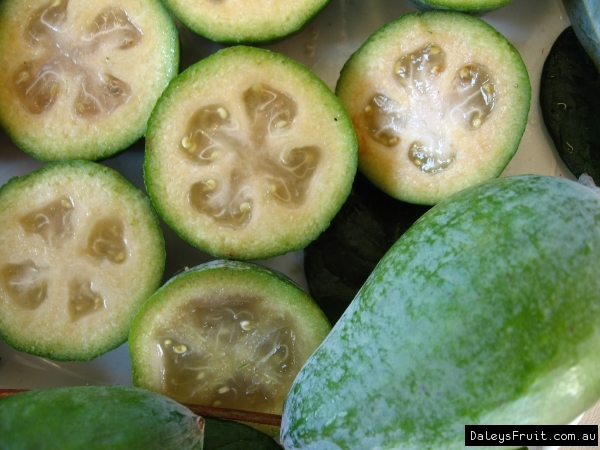 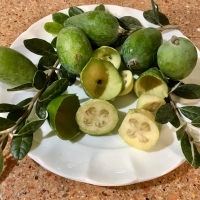 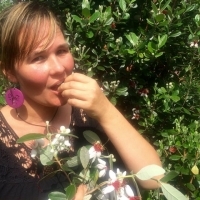 Sometimes called the pineapple guava the feijoa, although in the same family is not a guava. 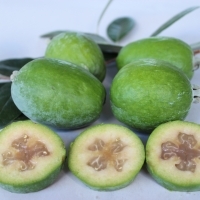 Becoming increasingly popular as a commercial crop, the fruit has the taste and aroma of strawberry, pineapple, lemon, passionfruit and guava. 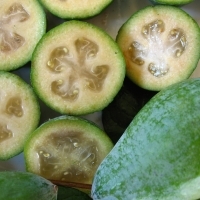 The tiny edible seeds are embedded in a jellylike center. 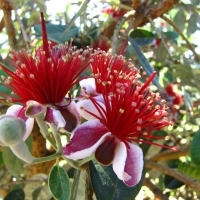 The spectacular purple, pink and white flowers have sweet delicious petals that make a superb ingredient in sweets and drinks. 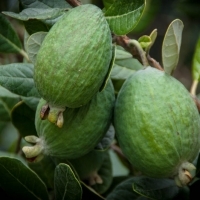 Trees are very attractive and can be planted to form beautiful flowering and fruiting hedges, screens or windbreaks. 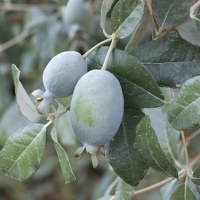 They espalier well and can be trained as a small standard tree or a multi-trunked specimen. 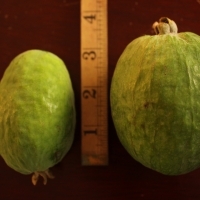 They are well suited to pot culture and even seedling trees will produce flowers and fruits after as little as three years. 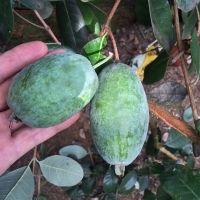 plant more that one variety as they fruit best with cross pollination, they all have a similar appearance, size, shape and colour so you can mix them with them looking odd, or choose the seedling plants, they will all be genetically different and are economical for using in a hedge, they take a little longer to fruit, approx 4 years and the fruits will all vary.